In 2006, I built a dayshade for Poore House. It was visually compatible with the medieval setting, packed down small for easy transport, and was easy enough to set up that I was able to do so on my own in 20 minutes or less. 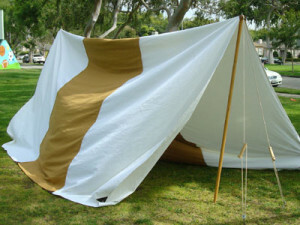 It had a distinctive design that was easy to spot from across the field, and was large enough to house up to 8 people for a tournament (and did, on numerous occasions), but unassuming enough that two people could populate it without seeming like they’d taken more than their fair share of space. Finally, it had a modular design, so that other dayshades that shared its side dimensions could be linked up with it. It was, if I say so myself, a great dayshade. It also had a few structural problems. The grommets I used did not take as well as they should, and several of them fell out. Others tore into the cloth of the reinforcement panels,and then into the dayshade itself. The sides of the dayshade were simple selvedge edges that weren’t turned, and thus were less than they ought to have been. The loops at the bottom of the dayshade were too large to be wieldy, and the ones on the sides tore off at the selvedge during a particularly nasty windstorm. Four years later, the first Poore House dayshade has been patched several times, yet is still on its last legs. It will most likley not survive another event. Now, four years of hard service isn’t bad for a first go. But Poore House without a house is poor indeed, so a new dayshade was built, improving on the original design while maintaining its essence. Directions on how to make a dayshade in a similar style appear below. In order to link up with others of its design, some of the dayshade’s dimensions have to be consistent from dayshade to dayshade. Included here are my dimensions, which need to be followed to link with Poore House dayshades. If your group wishes to modify the design for its own purposes, be sure to codify the universal dimensions so that they are consistent with all dayshades in the set. This isn’t to say that the design is set in stone. An owner of one dayshade has different space needs than an owner of another dayshade, so my design allows for a variety of widths to allow for anything from a small dining fly to a sizable tourney gallery, each with the ability to be both freestanding and part of the greater whole. 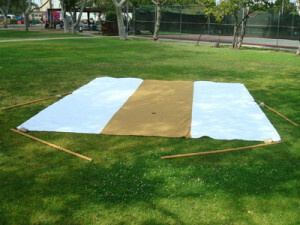 These instructions call for three panels using 60″ fabric, resulting in a ~15′ wide dayshade. Narrower fabric is equally valid, and will result in a narrower dayshade. 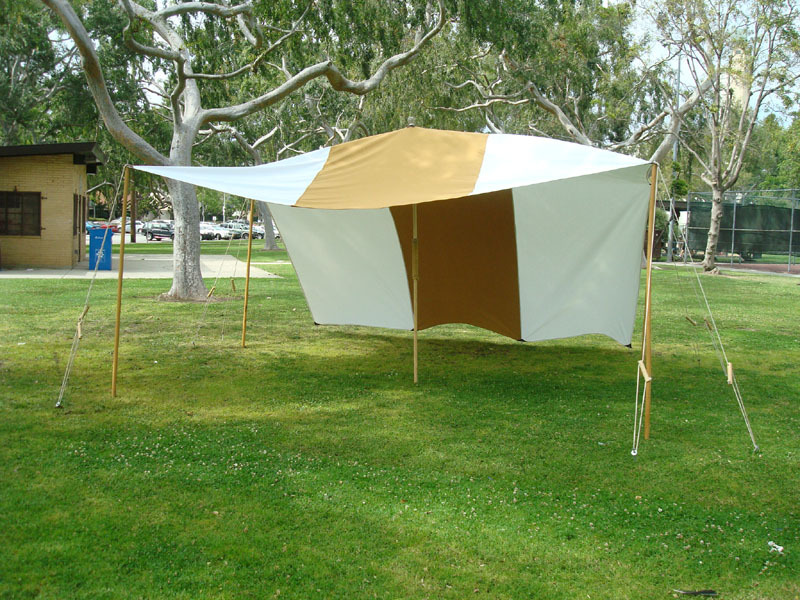 Fewer panels are also valid, and if you use one panel (perhaps as a small extension to your main dayshade) or two panels (for a small family) you probably won’t need to build a center pole. To differentiate between types of dimensions, all rigid dimensions will be marked with an asterisk (*) before the number. 4 5″ steel rods, 3/8″ in diameter..
Before you do any other sewing, you will want to install your center pole reinforcement. Trust me, you don’t want to wait until after constructing the body of the dayshade to try to wrestle all the fabric through the machine. Take your center panel and determine which end will be the front. Fold the panel in half lengthwise, so that you have a very long rectangle. Measure along the fold to a point *4.5′ from the front. Place a mark here. This is the peak of your dayshade. Take the two 3″x3″ pieces of leather and cut 3/8″ round holes in the center of each. Place them together, smooth sides facing each other, and use a pin to poke small holes through three of the four corners. 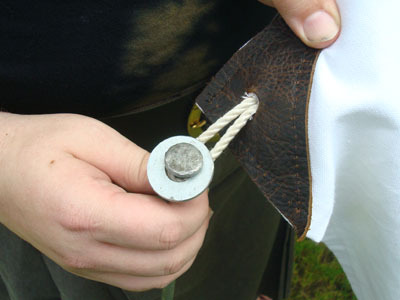 Take the pieces and place them on either side of your fabric, so that the 3/8″ holes align with the mark you made. Push pins through the smaller corner holes to align your pieces. Now use a leather-capable sewing machine to stitch these pieces together, starting at the corner without a pin and removing the pins as necessary. Once you’ve completed this, slowly push an awl through the mark in the fabric until it has expanded to meet the edges of the holes in your leather. From here, put a 1″ hem on all four sides of your rectangle. Congratulations! You’ve just done the major workload of this project.Now mark the front corners just inside the seam. Measure *9′ from those marks along each side and place another mark just inside the seam. These will be your main pole points. Do this for your side marks and the back edge of your dayshade where the two seams meet the hem. Take one of the 4″x4″ squares of leather and fold it diagonally. Find the point in the newly formed triangle midway between the right angle and the center of the hypotenuse and push a pin through that point.Cut 3/8″ holes centered around the points you’ve just found. Fold the leather over the fabric, smooth side out, so that the hole is aligned with the mark you made (for the sides) or just to one side of the seam (for the back). You should not be able to see the seam through the hole. Stitch along the sides of the triangle, making sure your leather is aligned on both sides. 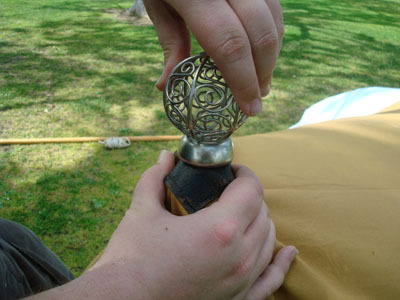 Now push an awl through the center of the hole, opening up the fabric to the size of the holes in the leather. Do this for each of your four corners. Take one of the 4″x4″ squares of leather and cut it in half diagonally. Place the pieces smooth sides together. Find the point in the triangle midway between the right angle and the center of the hypotenuse and push a pin through that point. Cut a 3/8″ hole centered on that point. Place the leather pieces on either side of the corner, smooth sides out. You should not be able to see the seam through the hole. Stitch along the sides and hypotenuse of the triangle, making sure your leather is aligned on both sides. Now push an awl through the center of the hole, opening up the fabric to the size of the holes in the leather. The canvas for your dayshade is now complete. Now we move on to hardware. Drill a hole in the top of each of your *78″ poles just wide enough to force in your rope pin dowels. Tap the dowels in with a hammer, so that only 2″ remain outside the pole. Take one of your 48″ poles and slip the joiner onto it, so that the pole goes half-way through the joiner. Secure the joiner to the pole by putting two screws through both the joiner and the pole at one end. On the other 48″ pole, drill a small hole at one end just wide enough to accept your finial screw. Take your eight 6″ dowels and drill two parallel holes through the width of each of them, on either end of the dowel. The hole should be wide enough for your rope to slide through easily. Each rope handle should pair up with one end of your ropes. Run the end of the rope down through one hole, then up through the other. Secure the end of the rope with a sturdy knot that won’t allow the end of the rope to go back through the hole. 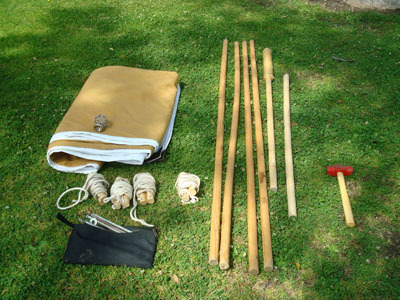 Find the midpoints of each of your ropes by folding the ropes in half. Just below the midpoint, tie an overhand knot with the doubled rope, leaving a 1″ loop at the midpoint. Your project is now complete, and you have a fully functional dayshade. 2. Lay out the canvas, placing the front edge where you want it to be once it is set up. Place poles, ropes and stakes around the canvas. 3. Screw your finial into the top half of the center pole, through the center reinforcement. 4. Start with a side pole. Push the peg through the hole in the side reinforcement and loop the rope over the peg. 5. 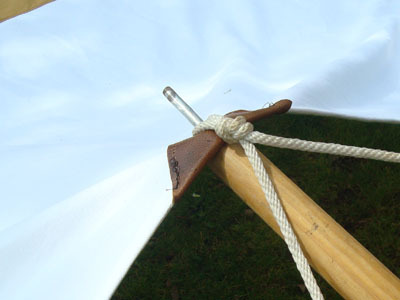 Stake the ropes out at 60 degree angles from the side of the dayshade. Through the tension on the ropes and the weight of the canvas, this pole should now stand upright. 6. Now do the same with the other side pole. You should, at this point, have what looks like a large, unstaked pup tent. 7. 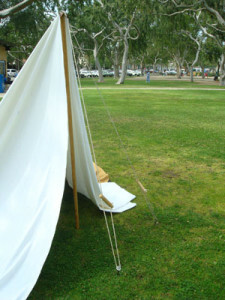 Set up the front poles in a similar fashion, placing the ropes at right angles from the edges of the canvas. 8. 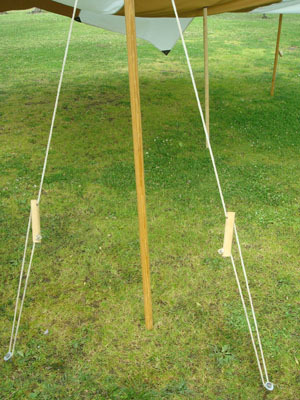 At this point, adjust the placement of your poles and stakes so that your canvas is in a fairly taut rectangle. You may want to place the second half of the center pole at this point. You will most likely have to remove and replace a couple stakes, so don’t pound them in too heavily. The result should look like a shallow-roofed tent with one wall that’s too long. 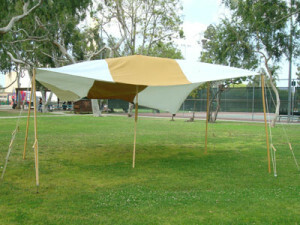 Or, if you’re setting it up on a fairly windy day, like this. 9. The last step is to stake down the back corners and edge points. Pull the rope loops through the hole in the reinforcements and put the stake through the loop. 10. Move all your gear in and enjoy the envious looks of your friends, because the dayshade is up and ready for the tourney!